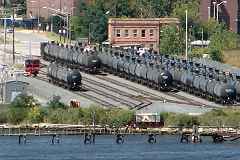 The B&O's arrival at the East Brooklyn peninsula south of Baltimore, Maryland was preceded by that in 1915 of the Chesapeake and Curtis Bay Railroad. 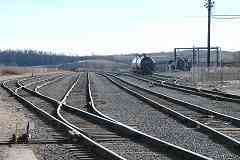 The C&CB with its 7 miles of track soon became part of the Western Maryland Railroad. 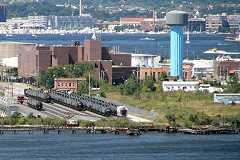 Though this tour page primarily traces the B&O's Seawall Branch around the peninsula it also highlights C&CB relics. Like the B&O, the C&CB/WM eventually merged into CSX, so all have married into the same family. 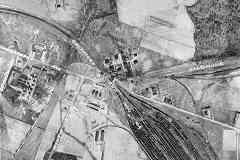 Aerial photos from 1920, 1927, and 1964 courtesy Johns Hopkins University. 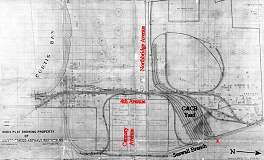 The Seawall Branch quickly opens into the Seawall Yard shown on the map, then continues east before turning south. 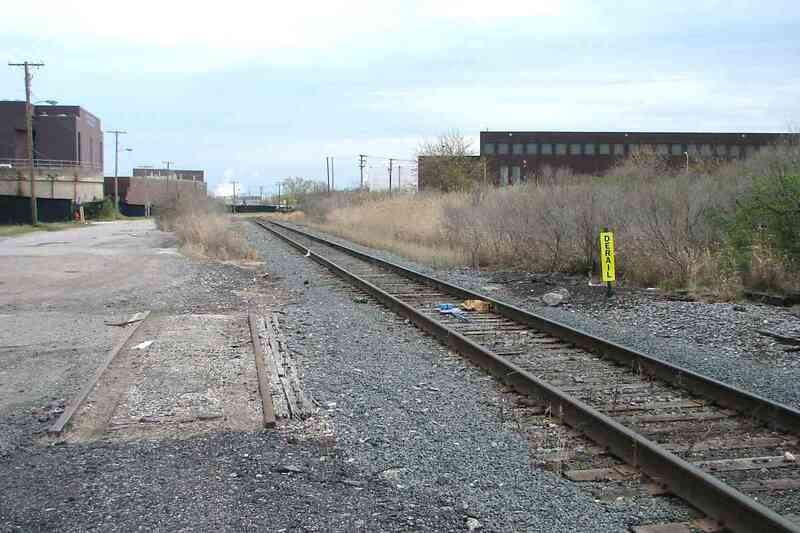 There are no mileposts extant, so this page uses the northeast end of Curtis Bay Yard as the "0 mile" reference point. 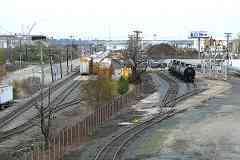 Near photo center, the Seawall Branch splits from the Curtis Bay Branch and proceeds to serve the Fairfield and Wagner's Point industrial areas. 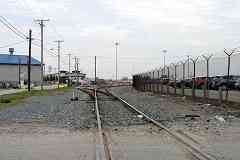 The Seawall Branch is unsignalled, not counting the grade crossings of course. Curtis Bay yard is on the left. 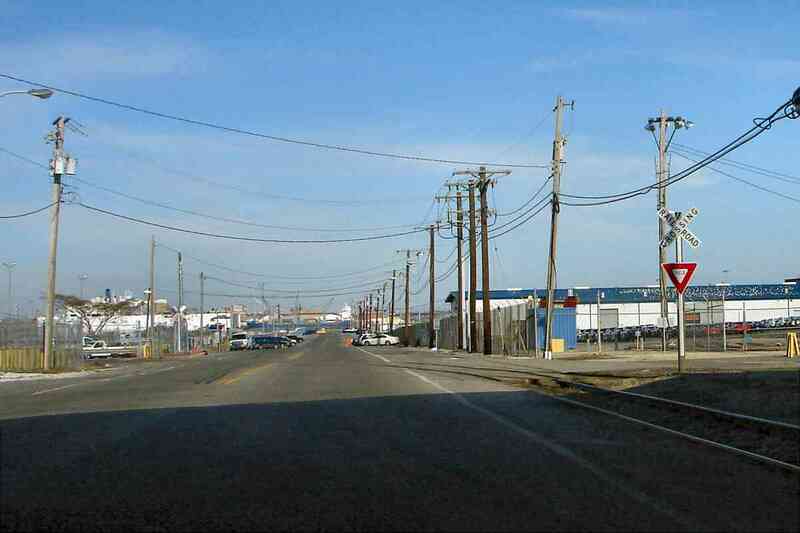 At the time of this photo, the dregs of Fairfield's shuttered 20th-century petrochemical plants lingered in the form of abandoned buildings, rusting equipment, layers of grime, and swamp-broken asphalt, where the streets were paved at all. 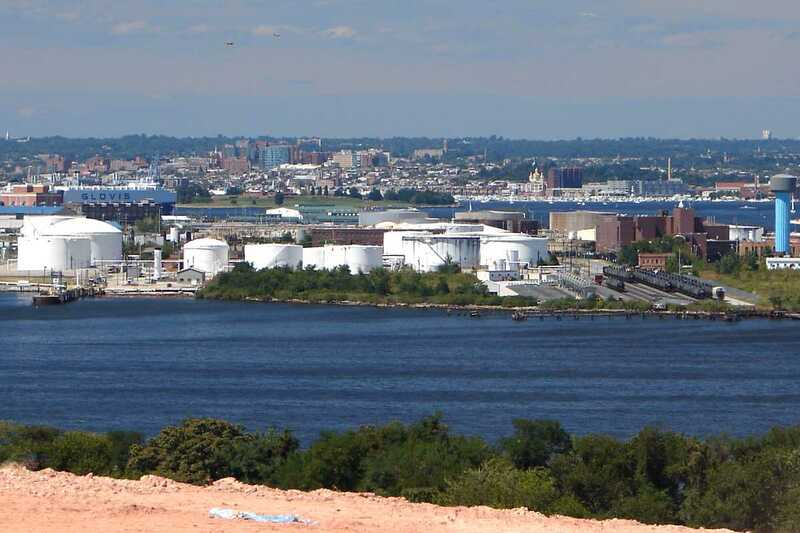 In the years that followed, spurred by the expansion of a wastewater treatment plant, much cleanup work was done in the vicinity, and now the area looks a lot more welcoming and a lot less of a wasteland than it had. 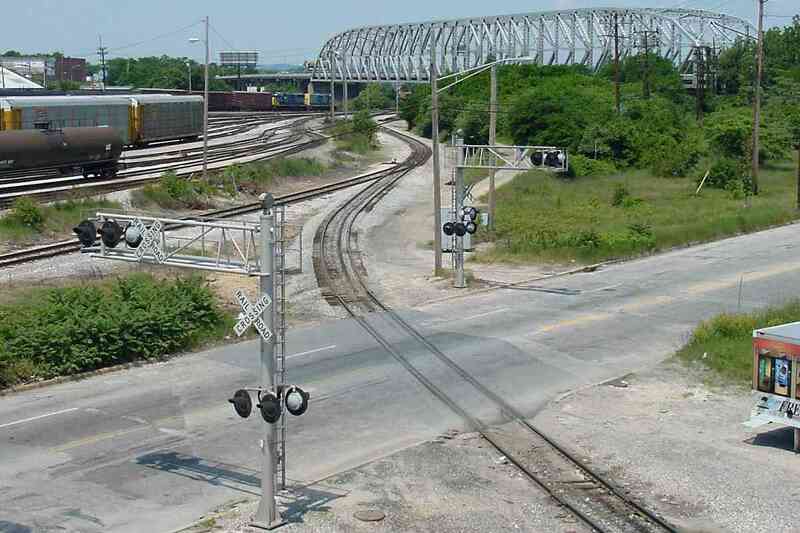 Note the weedy brush that had grown along the CSX tracks is now tended grassland. 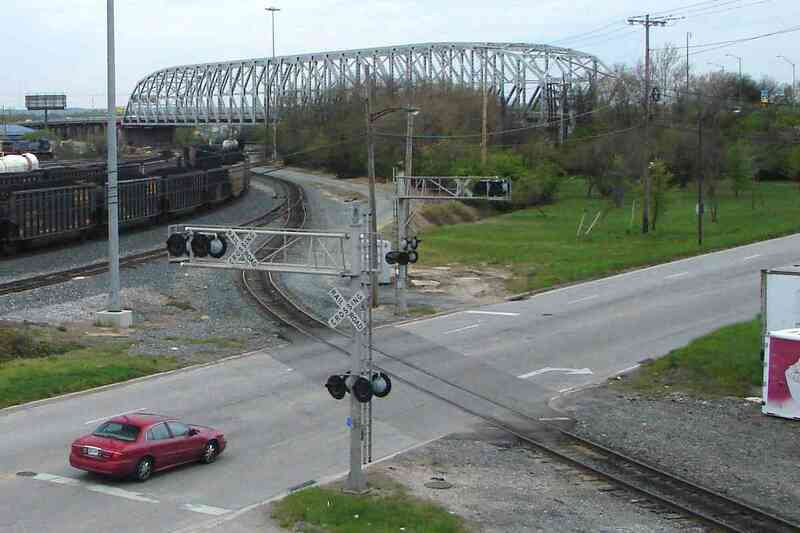 One technology change: CSX replaced the mechanical warning bells atop the Shell Road grade crossing warning poles with electronic noisemakers. 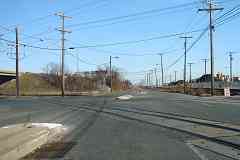 Before the railroad expanded and I-895 barged through, this area was occupied by the town of Masonville. 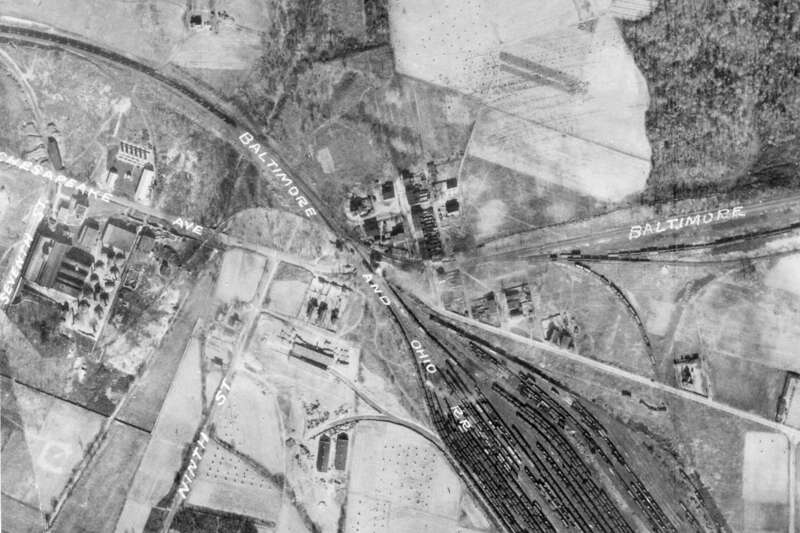 In the 1927 aerial photo Masonville is the group of buildings at center near where the Seawall Branch splits off from the tracks bound for Curtis Bay Yard at bottom. Bales of hay dot the that time period's farms. 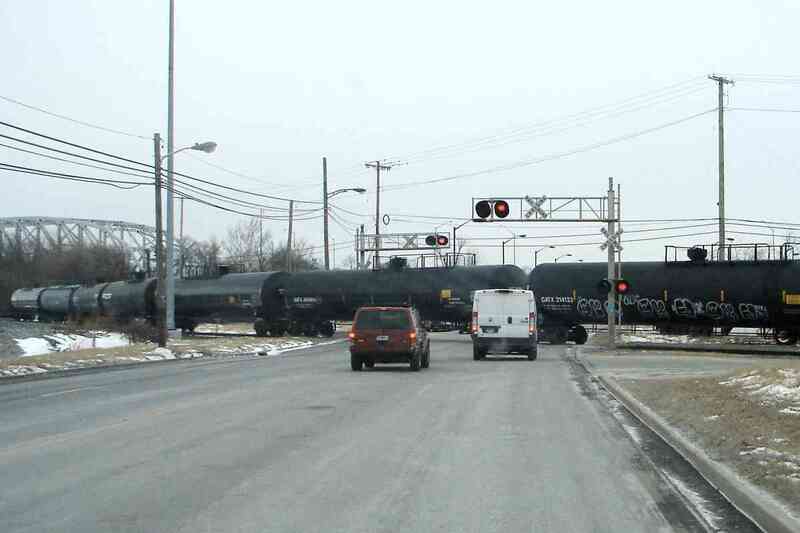 When its too cold to railfan, action pics shot from inside a warm car are preferred, like this one at Shell Road. This is the branch's busiest grade crossing. 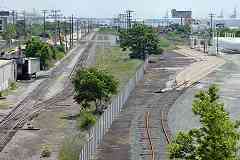 Seawall Yard is just beyond the right edge of this photo. 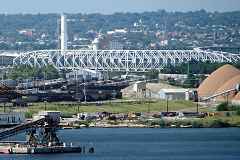 Things were quieter in 2001 before the cleanup. That's an empty Seawall Yard at distant left center. Note the junk pile at distant right. 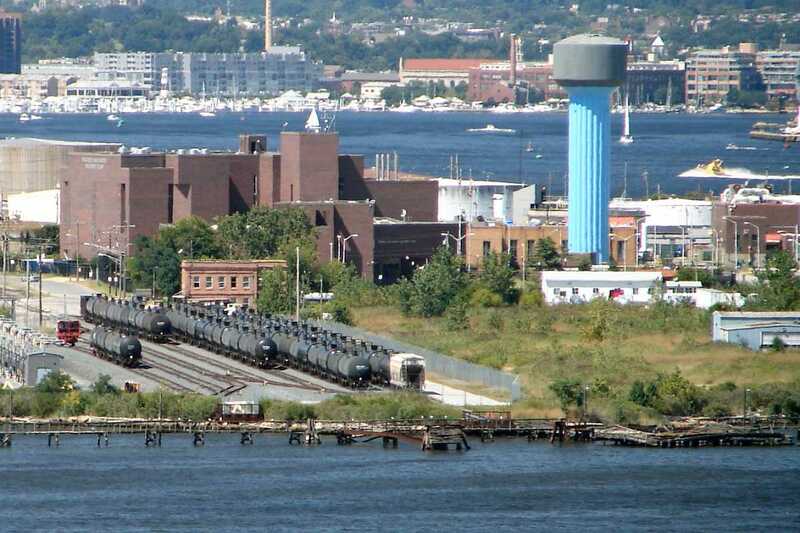 A similar view years later: less junk, more trains. 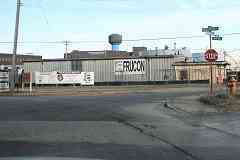 The Fairfield Auto Terminal (left) has expanded substantially since 2001, hence the autoracks. Frankfurst Avenue parallels on the left. At the Childs Street intersection two tracks peel off from Seawall Yard and cross Frankfurst Avenue. 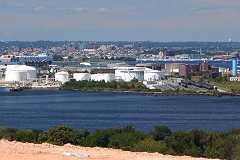 I-895, the Harbor Tunnel Thruway, is on the left. For now we'll follow the spur. 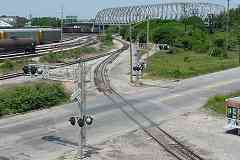 After the shadow of I-895 one of the spur tracks heads right, the other left, both bound for automobile lots. 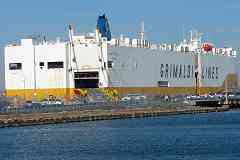 New cars are shipped from/to the port here. 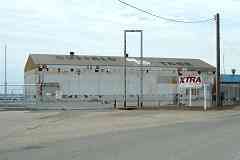 This spur has been serving various industries here since at least the 1920s. 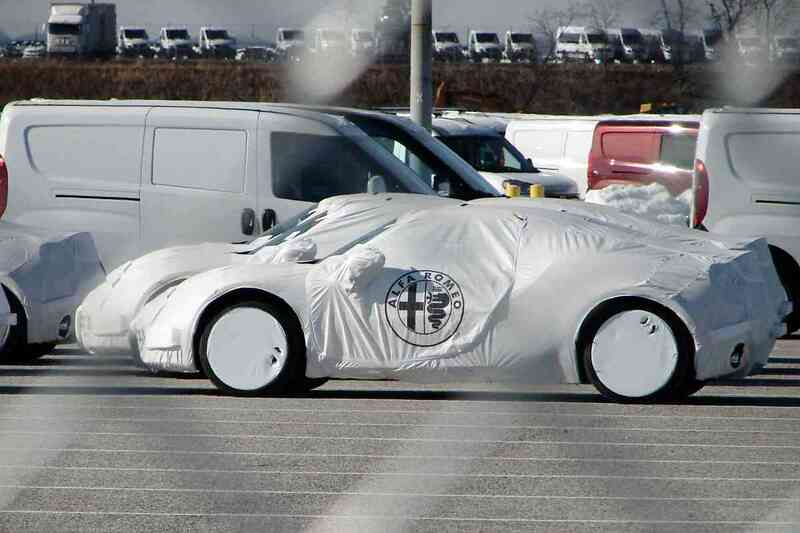 In the lots, a few dozen new 2015 Alfa Romeos, probably the Brera model, were being kept tidy for their upcoming owners. I'll take mine in red. Too bad there's all the fences, guards, and activity here. Oh well. 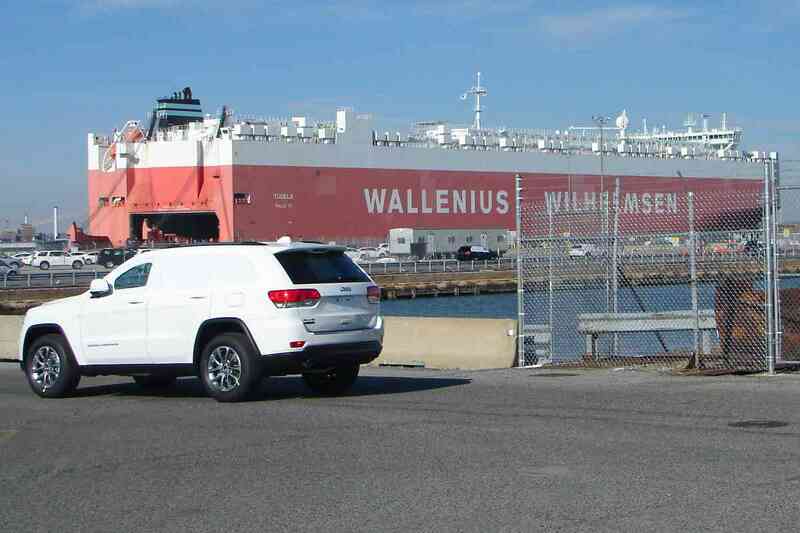 On this day a steady convoy of Jeeps previously disgorged by autoracks rolled past to refill ships that had transported the Alfa Romeos across the Atlantic Ocean. 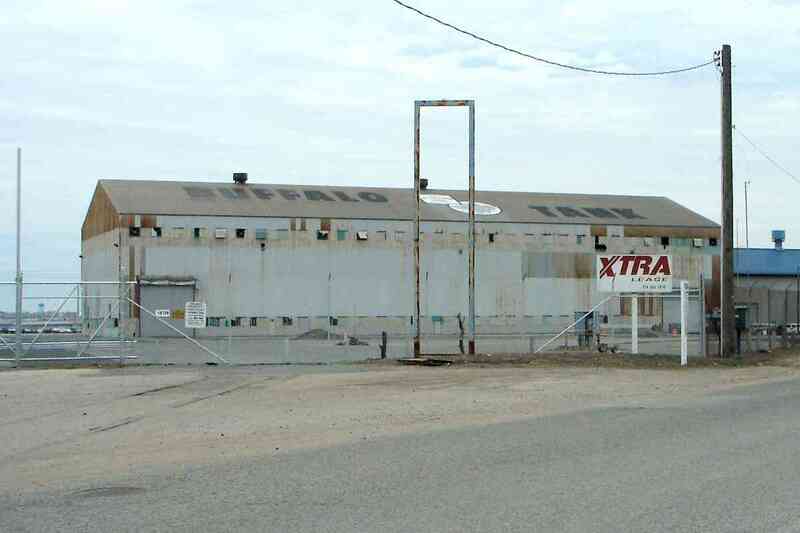 Their windows are protectively covered, except for cutout areas for loader/driver visibility. 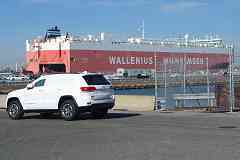 Wallenius Wilhelmsen's Tugela cargo vessel can carry almost 8000 automobiles across 5 interior decks. 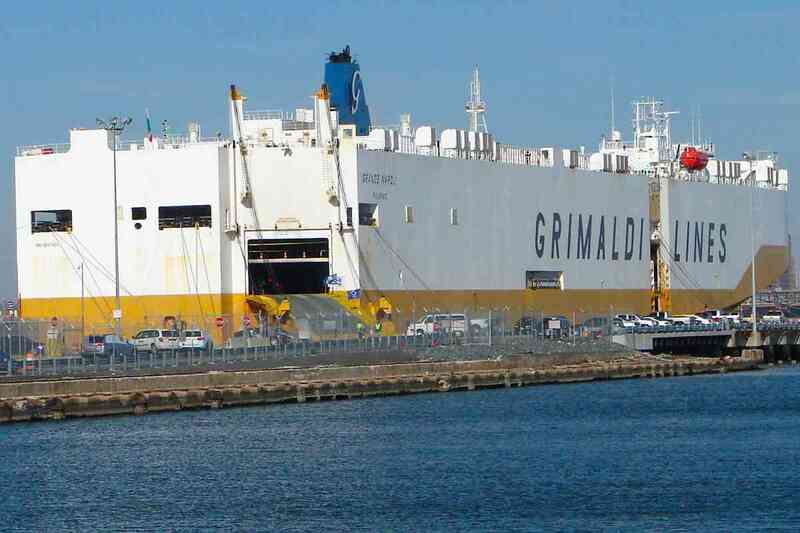 At nearly 100 million pounds weight when empty, plus a cargo carrying capacity of about 30 million pounds, ships like Grimaldi's Grande Napoli are huge: note the multi-lane ramp into the multi-deck interior. East of the car import/export operation a different spur peels from the Seawall Branch to serve state facilities near the western end of the Baltimore Harbor Tunnel. That's the asphalt of Frankfurst Avenue at photo bottom. A disused spur connects to Buffalo Tank, one of the last vestiges of Bethlehem Steel's presence in Baltimore. 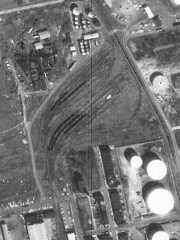 This site has filled many needs, including ship building (WWII), ship dismantling (post-WWII), and similar industrial activities. 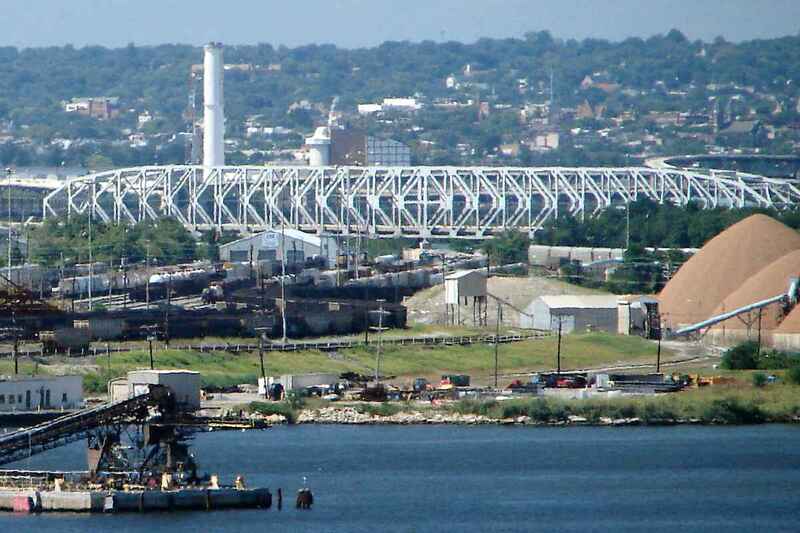 This was part of the expansive Bethlehem-Fairfield Shipyard where the SS Patrick Henry, the first of many US Liberty Ships of WWII, was built and launched. 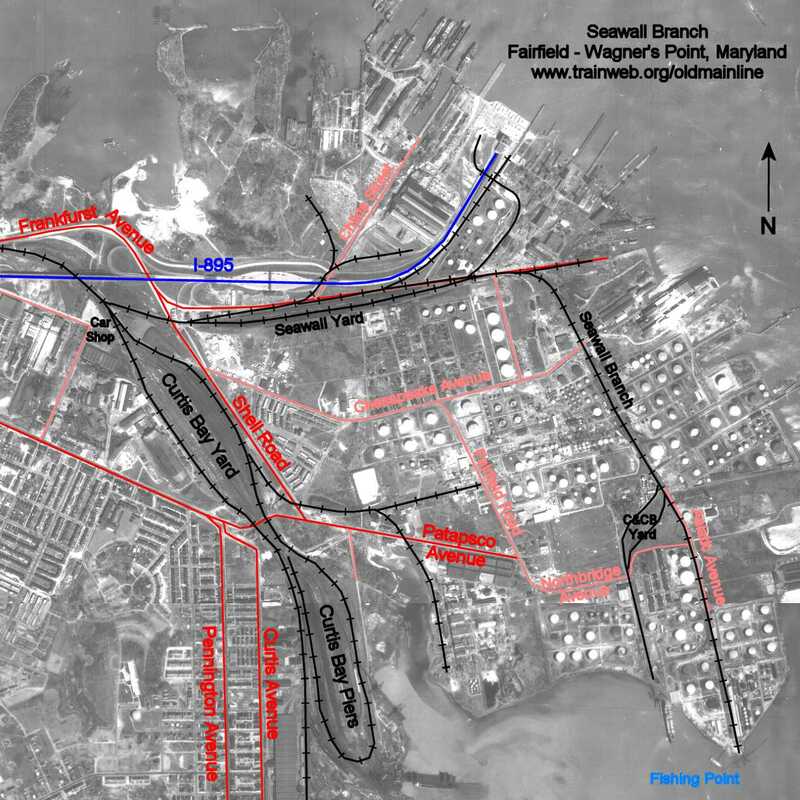 Frankfurst Avenue finally runs out of land at Chesapeake Terminal, or what the railroad calls Arundel Curve, named for the Arundel Sand and Gravel Company. 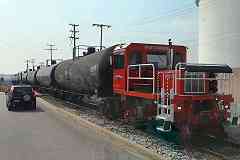 Currently TDSI (a division of CSX), Vane Brothers, and others associated with automobile import/export are busy here. Beyond Arundel Curve, to which this view looks back, things get less formal thanks to sparse train activity. 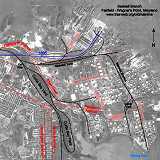 For example, there are no stone culverts here, nor steel pipe ones, merely white plastic ones to assist with drainage. 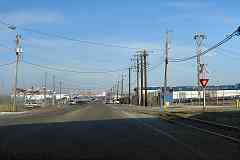 Only bits and pieces remain of the petrochemical industry that had bustled here. 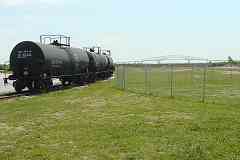 The dearly departed left hazardous waste behind that has required years of cleanup effort. The area's bleak appearance, particularly during winter, might be helped by a few evergreen trees. 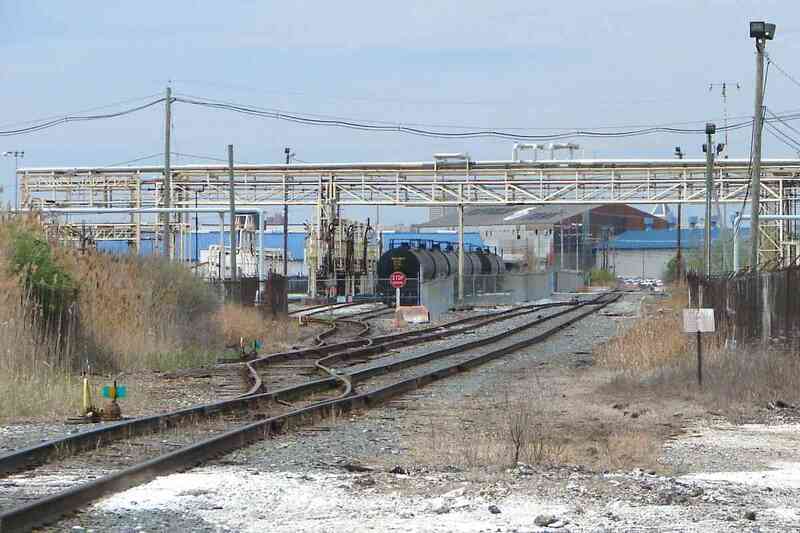 Former employees of these companies and their families continued to reside in the area despite its industrial nature, and reportedly unusually high cancer incidence rates. 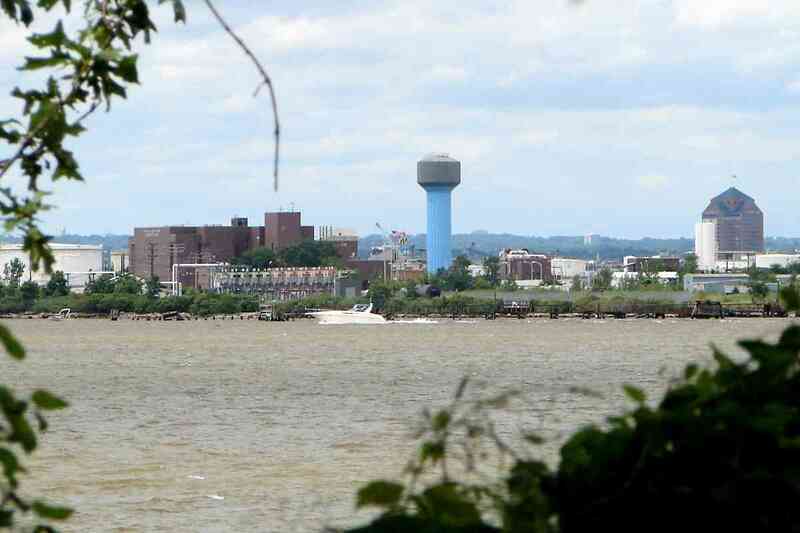 During the 1990s groups raised money to relocate the straggling residents out of Fairfield and Wagner's Point, a process that took over 10 years to complete. 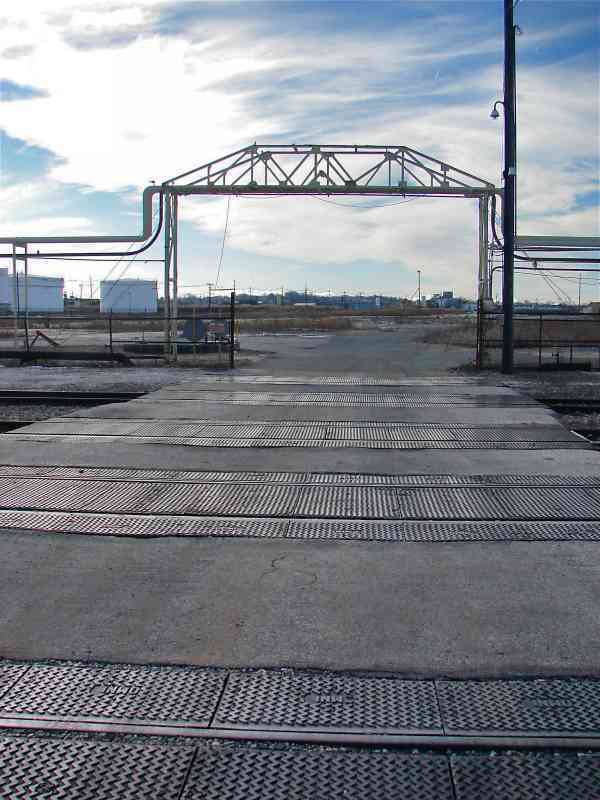 Above ground pipes are easier to install, even if they must leave clearance for trains, plus easier to monitor for leaks and to repair. 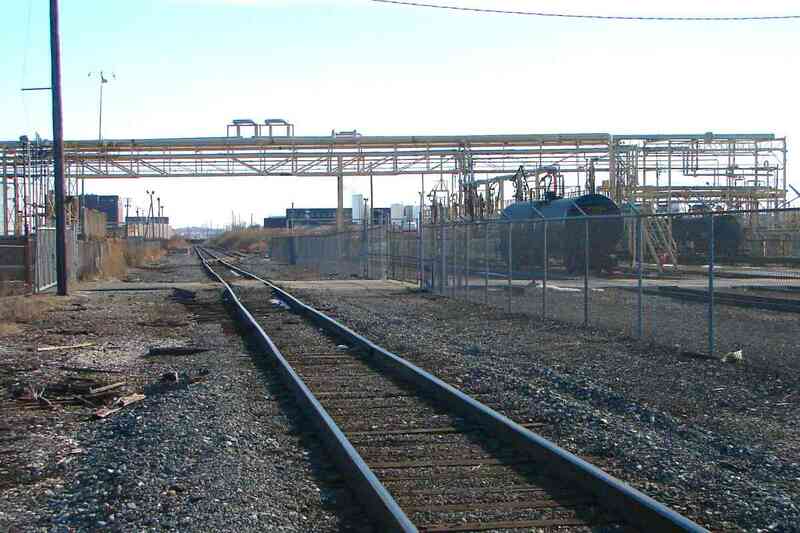 Specially-designed materials are employed at industrial grade crossings like this. With the residents gone, acres are now desolate, fallow until the next industrial boom. Industry first arrived at Wagner's Point during 1883 when Martin Wagner moved his canning factory from East Baltimore. 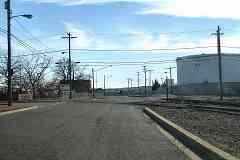 Expansion of the company town continued until in 1912 the cannery burned down, and to survive Wagner sold off much of the property to the then-burgeoning petrochemical industry. The Chesapeake and Curtis Bay Railroad Company arrived in 1915, later becoming part of the Western Maryland. 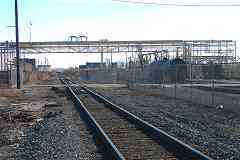 As part of its northernmost reach to serve this industrial yard, the tiny C&CB had connected with the B&O Seawall Branch on the left near the green switch indicator. The photographer's location is designated by a red x on the map below. 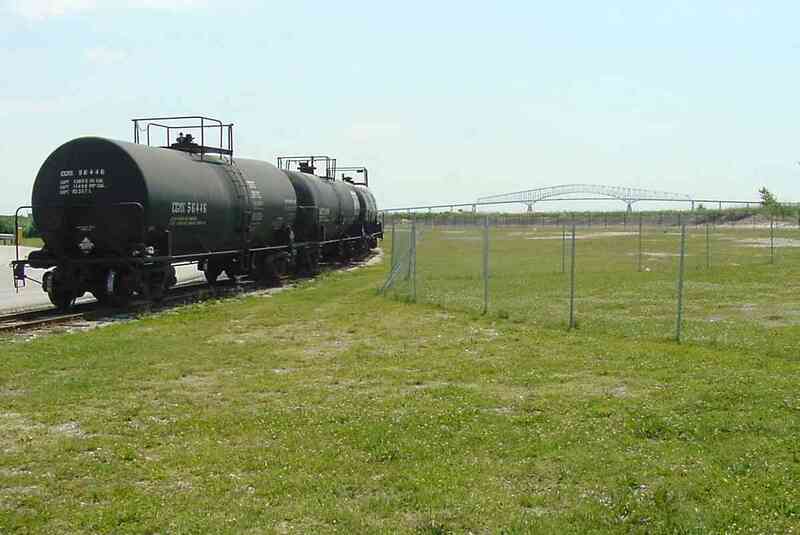 "Chesapeake and Curtis Bay" is a surprisingly modest name for a railroad. So many others of that era attracted investors via grand, aspirational names like "Chesapeake, Curtis Bay and Pacific". The Chesapeake and Curtis Bay Railroad was mainly a car float operation, back when that phrase meant rail cars rather that the automobile import/export seen back at Childs Street. 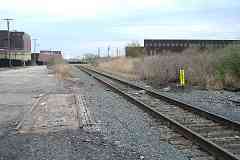 The C&CB's track looped within Wagner's Point (and possibly on the south side of Curtis Bay too) to access various companies, then exchange the rail cars with the B&O here, or float them from a slip and wharf at the left edge of this map to the Pennsylvania RR at Clinton Street or the Western Maryland RR at Port Covington. 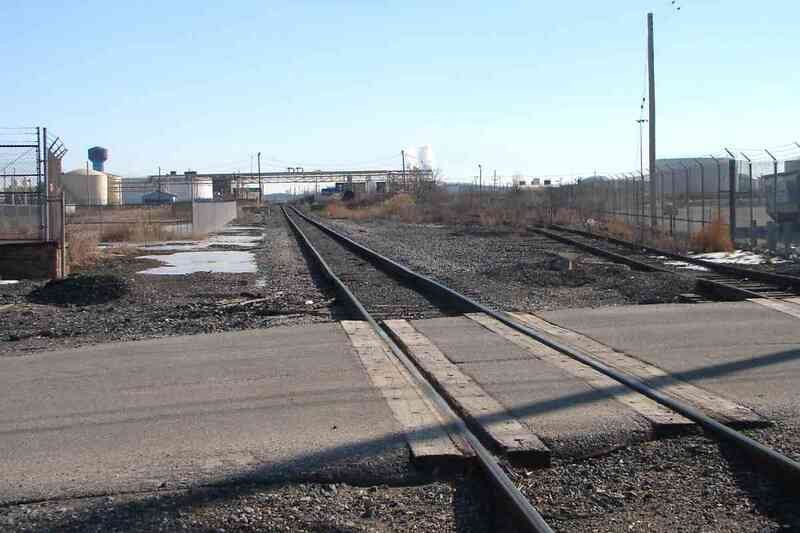 The track parallelling Northridge Avenue off the top of the map may have connected with B&O track that emerged from its Curtis Bay Yard. By this time this map was drawn, the C&CB was already under Western Maryland control. 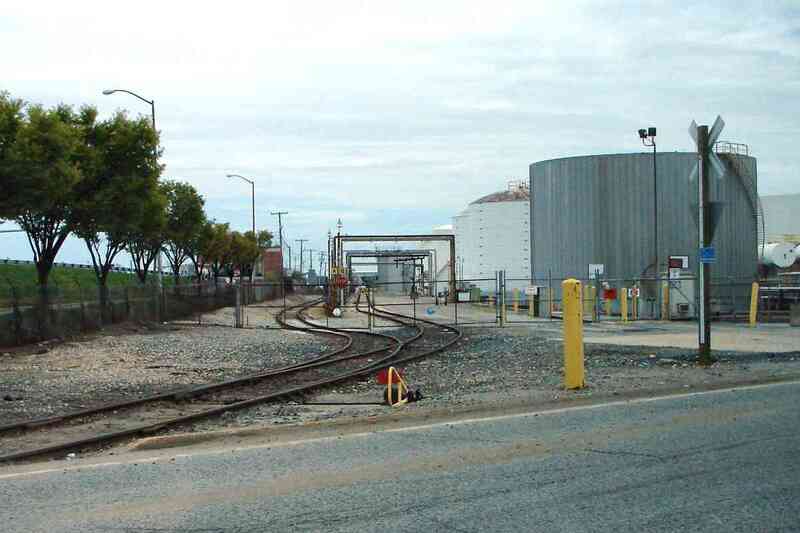 Its wharf remains today, though its rails have been swapped out for pipes that can offload/onload ships. 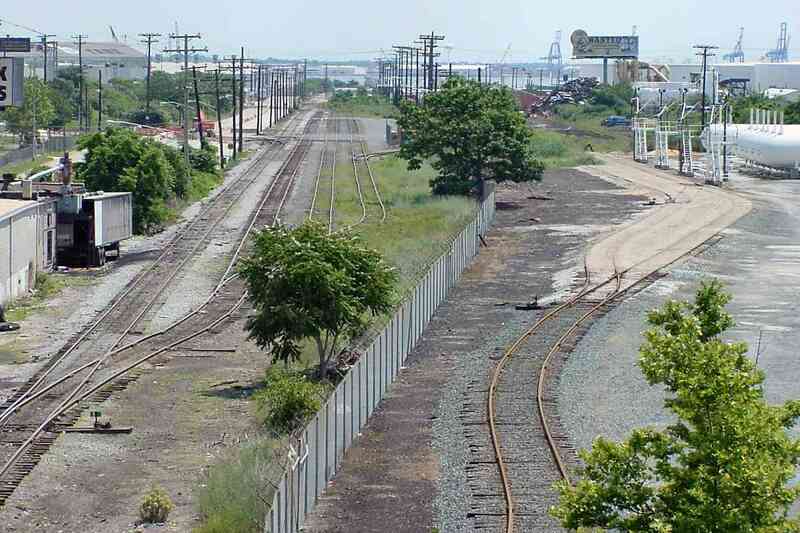 In the brush on the right had existed the only yard the C&CB had at the Point. 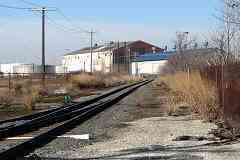 Those tracks have been removed and I observed no artifacts but such can easily be hidden by weeds. The photographer's location is designated by a red x on the map above. 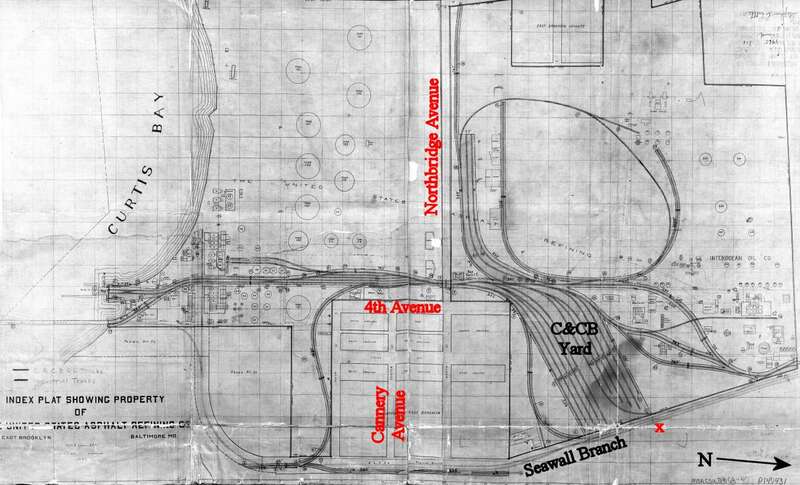 On the map above you may have noticed how the C&CB's tracks necked down to a grade crossing near what had been the intersection of 4th and North Streets, now 4th and Northbridge Avenues. The lighter pavement stripe across the bottom of this photo is a remant of that crossing, repaved when the rails were pulled up. 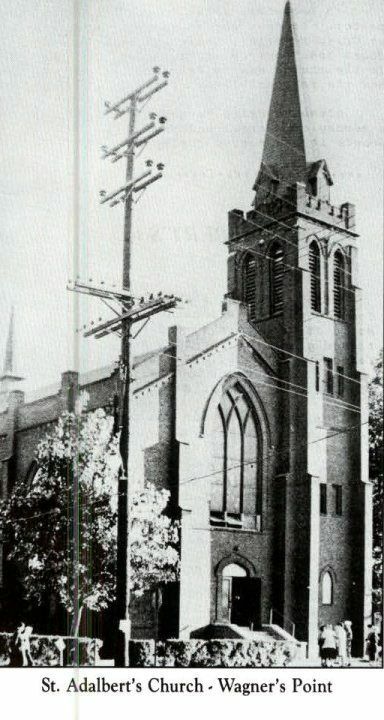 Straight ahead had existed the homes of the workers of the company town, along with St. Adalbert's Church that survived until 1969. 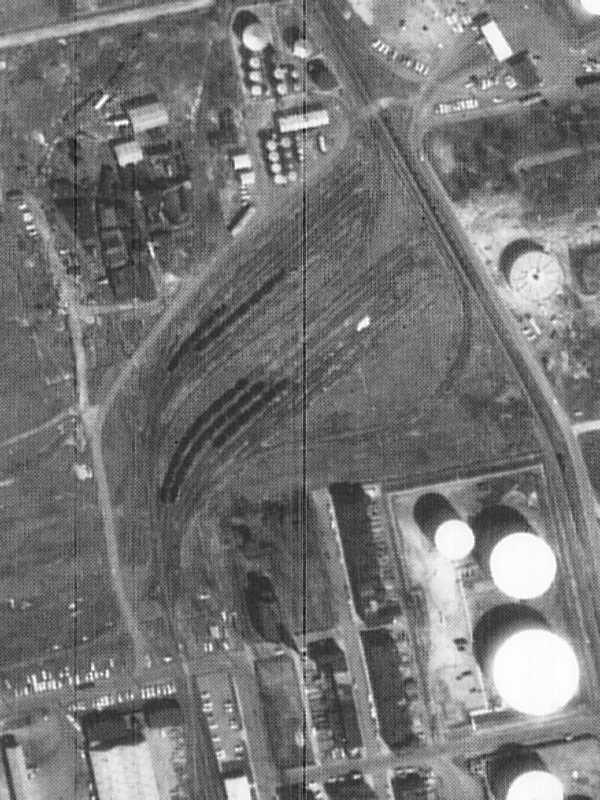 In the 1964 aerial photo at right you can see the yard, and below that the grade crossing and steepled church. This part of Asiatic Avenue paves over a C&CB siding that ahead, where more pavement now lies, had crossed the Seawall Branch. The track curving left serves industry. Back in 2001 that left-track permitted these tanks a nice view of the Baltimore Beltway's Key Bridge about 2 miles away. 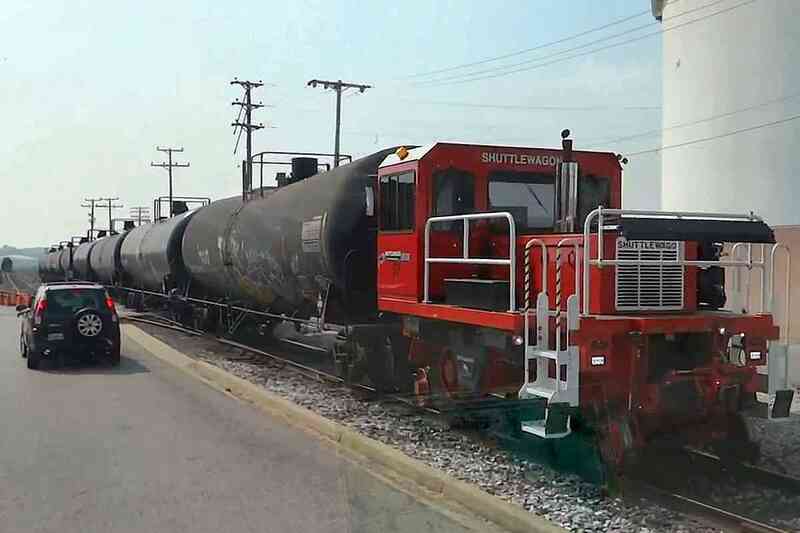 Those tanks don't move by themselves, well, at least not when ya want 'em to, hence one of these cool railcar movers is called to duty. 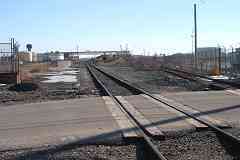 The tracks, re-extended to the water during 2006, dip to a car slip at what is called Fishing Point. Across Curtis Bay the equipment silhouetted on the distant hill is toiling at the Hawkins Point Landfill. The rightmost curving track, the one surrounded by fencing, had connected to the C&CB's wharf but now serves only as a siding. From the Hawkins Point Landfill one can look north across Curtis Bay to Wagner's Point. In the photo above on the right are black tank cars in the yard at the end of Seawall Branch. while on the left the ex-C&CB's wharf pipes extend into the water. Can anyone identify the tall structures on the distant horizon both left and right in the photo above? The landfill does not reach quite as high as a plane, but these two panorama shots capture similar views, one fron 1920 and the other 2015. The wooden structures poking out of the water at right are the B&O's disused docks in the process of being reclaimed by the tides. It appears cars are no longer exchanged here between land and sea. A magnified view shows the end-of-track bumper, the upside-down yellow V, as well as the red Shuttlewagon. 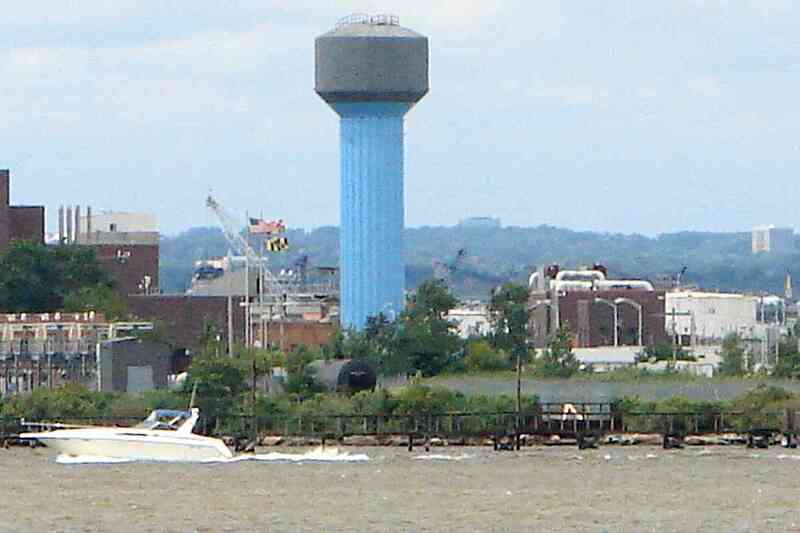 A view from water level also shows the end-of-track bumper, the upside-down yellow V. The large red brick building at distant left is the Patapsco Water Treatment facility, and the tower on the right had belonged to 1st Mariner Bank, now CareFirst, in Canton some 4 miles away. For a closer and better look at the carfloat remains you'll need to bring your boat. Hope you enjoyed touring the Seawall Branch. You may also enjoy touring the adjacent Marley Neck Branch.